Saala Khadoos for me is the Movie of the month January 2016. This month saw some big Bollywood releases like Wazir (two stalwarts wasted in bad storytelling), Chalk N Duster ( a nice movie to claim the place of teachers in our society and a comment on today's education system), Kya Kool Hain Hum 3(vulgarity personified), Mastizaade (another Sunny Leone disaster) and Airlift (impressed with Akshay's performance but story not connectable) along with some other movies. 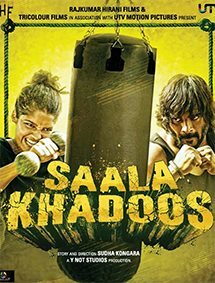 Saala Khadoos stood victorious both in story and performances. Cast: R. Madhavan as a boxing coach is the male lead of the film and new comer Ritika Singh is the female lead in it supported by Mumtaz Sorcar, Zakir Hussain, Nassar and others. The film is directed by Sudha Kongara and produced by Raj Kumar Hirani, UTV and R. Madhavan. Marketing: Week marketing as far as reality show promotions are concerned but trailers of the movie were present on every channel at different time slots. Many people knew its release date which is a sign that marketing was up to the mark but not aggressive. Story : Adi Tomar (R. Madhavan) had a dream to win the boxing gold for India. But his dream was cut short by politics in sports. He lost a decade recovering from the problem during which his sporting career ended. He remain frustrated after his loss and became cynical. He was appointed as women boxing coach but here also due to his rivalry with head of federation played by Zakir Husain, he was charged with sexual harassment case and send to Chennai to select boxing players a city which was least known for boxing players. It was a move to kill his coaching career as well. Here he met a fiery young woman Madi (Ritika Singh). Adi discovered in her passion and hunger to win similar to him. He became keen to train her for national championship. In spite of her refusal he was adamant to coach her and even pay her to attained training sessions. So begins a partnership between a man who loves his sport and a girl who loves her freedom. It is the beginning of a beautiful friendship and a journey towards an impossible dream. Hit : Outstanding performances by R. Madhavan and Ritika Singh. Superb story and screenplay which never let down your interest from the movies. Film succeeded in conveying the message that politics and favoritism have ruined our sports organisation. I liked it more than Mary Kom which failed to bring out the political part of the games common in India. Miss : You will definitely miss some good songs in the movie. Although songs are apt for the movie they don't impress the audiences. Verdict : Go and watch it this weekend. Rating : I will give it 4/5. Was in a dilemma to watch or not, now I think I should go for it. Thanks for the review!